Hope's Cafe: I Finished the 6-Week Kettle Worx Program! 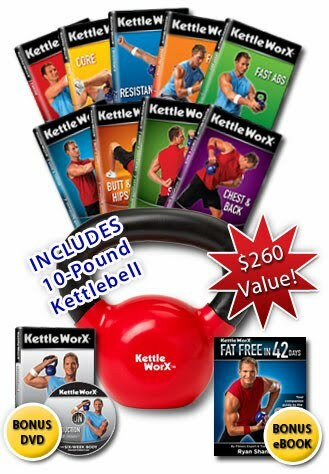 A few weeks ago I posted about the Kettle Worx exercise program I had started. Well, I finished the 6 week Body Transformation program. And yes, I survived! In fact, I loved the whole program! Yes, it is a challenge. Yes, sometimes it's hard to find the energy to finish the workout. But it is honestly the best exercise program I have ever used. In fact, I have already gone back to the beginning, and started going through the program all over again! There are so many benefits to this program. I usually do my workout in the morning, and it really helps energize me for the rest of the day. I noticed a major difference on the "off" days during workouts. Most of the time I did one of the extra dvd workouts provided with the set, but occasionally I missed a day. You'd think I would enjoy the chance to relax, but I actually missed not doing my Kettle Worx! My favorite dvd is the Cardio (it's the hardest one, too). They're all great though, and you can really feel the program working! I also loved the Fast Abs 10 minute workout. I used this one more than any of the other extra dvds :) This dvd targets the abs, and provides a fast workout for when you're in a rush. The Fast Fat Burn was a lot of fun too; this is also a 10 minute workout. Just because it's fast doesn't mean it's easy, though! I also liked that the Kettle Worx program is varied and fun. It's not all the same moves over and over; there are different moves that target certain areas, and new moves are introduced as you get further in to the program. Yet, at the same time, it's not confusing or difficult to learn. "Several recent studies have shown that short, intense workouts are actually more beneficial than longer, lower intensity workouts. That's especially true for cardiovascular health. It's also true for weight loss, as intense workouts raise your body's metabolic rate, so you're constantly burning more calories - 24 hours per day! That, plus our healthy eating plan, makes KettleWorx one of the most effective programs available for weight loss and cardiovascular health." "Ryan is the world's leading kettlebell trainer and foremost expert in kettlebell fitness. He is an internationally acclaimed trainer who regularly works with superstars and exclusive private clients, including the cast and crew of major feature films. For over ten years, Ryan has conducted private kettlebell training sessions working out of the Toronto Film Studio. In fact, kettlebells are growing in popularity largely due to Ryan's trainee-stars spreading the word about this remarkably effective training tool. These stars have gone on record recommending kettlebells - but should really be recommending Ryan Shanahan! Of course he was only in Toronto - his training unavailable to most - until now. Ryan has now developed KettleWorx. A program that results, at least in part, from the ridiculous demands made by film stars and leading models, who wanted a program that would give them an almost immediate body transformation. These stars demanded results they could see and feel in weeks, not months or years. Ryan did it for them, and has now transformed that same regimen into a fitness program that anyone can use to get those same ridiculous results: KettleWorx. KettleWorx is simply the world's fastest and most effective training system. In just six short weeks, 42 days, you too can now transform your body with KettleWorx, and with Ryan Shanahan as your personal, in-home trainer." So, if you're serious about losing weight, or just want to exercise for good health, I really recommend you check out Kettle Worx. They sell value packs for beginners, and you can pick a 5, 10, or 15 lb. Kettle Bell, depending on your current fitness level. 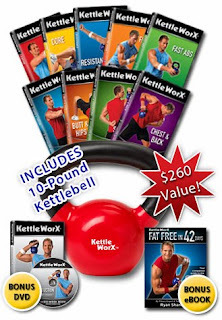 congrats... i just got kettleworx too..lets see some b4 and after pics... maybe it will inspire us beginners. I have been on the program for 5 weeks and I love it! I noticed a change in my body on week 3. It really works! I do KettleWorx and Fat Free Yoga in the morning before I go to work. It takes me about 45 minutes and then I am done.